Description: New versus old, CSX 8574 passes SBD 3257 in the siding in Lilesville NC on the Monroe Sub. 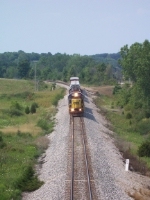 Description: CSXT Southbound Intermodal Train at Lacon, Al. Description: CSXT Y-163 arrives at Locust Point from Bayview. Description: A rare visitor to New Brighton, especially on a coal train, rolls in with 3 other UP units. Description: Q293 under Bay State Drive with CSX 5101, CSX 8574, and FURX 3036 on the point. Description: Furbie trailing on Q293-21. Description: Tried the shot from a few days ago again, this time with better power, but crappy sky.